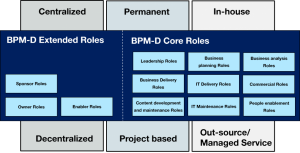 Processes are merely descriptions of “what we do” and the roles and responsibilities for executing BPM are detailed in the BPM-D® Framework Organisation Model. This is a reference model that recognises the various internal and external roles that play a part in delivering an effective BPM Discipline. It also includes a reference organisation structure together with examples of how this has been implemented in other organisations. Best practices are described and included in the BPM capability assessment (described earlier). For most of the major roles this also includes an outline of their responsibilities and key performance metrics. Implementing BPM requires clarity of the governance. Who is allowed to design and change processes and who is responsible for their successful implementation and performance. The model includes recommended governance structures that pragmatically overlay sound process management on existing (often complex) organisations.